Inspector Singh is a chain-smoking Sikh policeman, described as "dishevelled, overweight and bearded". He is five foot six inches tall but looking taller in his his turban which he is hardly ever without. He loves good food and drink, especially hot curries and ice cold beer. He is not too popular with his superiors who are only too happy to send him on missions abroad. Despite his apparently blundering ways, he is nothing if not persistent and and "with his usual intuitive insight" makes a skilled interviewer, and "despite appearances, it would have been a brave man who bet against Inspector Singh if it came down to the survival of the fittest." He is an engaging character but, unfortunately for this particular website, does not seem to observe his religion in any way, beyond wearing his turban. So it is stretching things to call him a clerical detective, but there are so few Sikh detectives (there is also Inspector Singh but I cannot really recommend him), that I decided to include him just the same! But, for this reason, I shall only be reviewing the first book in the series. Shamani Flint (1969 - ) was born in Kuala Lumpur, Malaysia. She took her Bar Finals at Trinity College, London, before studying for her Law Master's degree at Cambridge University. She became a solicitor in England before returning to Malaysia where she was called to the Malaysian bar. 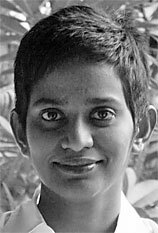 She worked at an international law firm in Singapore and travelled extensively around Asia for her work, before resigning to be a stay-at-home mum, writer, and art-time lecturer and environmental activist. She began her writing career by self publishing a children's series about a little girl called Sasha (written, in the first place, for her own young daughter, also called Sasha). She later moved on to crime fiction with the ﻿Inspector Singh series which, she explains, allowed "the interaction between people of different social stratas, race and religion to be explored at length". She is now the author of well over 50 books and lives in Singapore with her husband and two children. 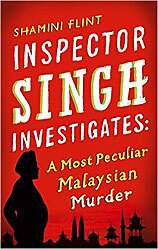 Inspector Singh Investigates: A Most Peculiar Malaysian Murder sees Inspector Singh not at all pleased to have been sent from his home in Singapore to Kuala Lumpur to solve a murder that has him stumped. Chelsea Liew - the famous Singaporean model - is on death row for the murder of her ex-husband. She swears she didn't do it, but seems to have the strongest motive as she had been struggling to keep her children, boys aged 17, 12 and 7. But her ex-husband may have outwitted her by converting to Islam, knowing that no non-Moslem would be allowed to bring up the children. Singh cannot believe that she is guilty (perhaps because "he had been bowled over by her looks") but when someone else confesses, he cannot believe his story either. Confronted with warring brothers, he gets involved in a complicated competitive business world, but his sheer persistence wins through. It makes an interesting story, all the more so because of its affectionate portrayal of the Malaysian background. Even minor characters such as Singh's sister come alive, as when we are told that she loved explaining: "That clothes dryer, my son bought for me as a present. He is doing very well, you know, and doesn't want his old mother to work too hard." But "She never actually used it. Baljit was not convinced that clothes squashed into a dryer would get a proper airing." Interesting too is Singh's growing rapport with the bright young Malaysian Sergeant Shukor, who had been told "to shadow the troublesome policeman from across the border. His unofficial mandate was to encourage him to leave as soon as possible by any means, including being obstructive. But he found himself actively helping out .... He had listened in on the interviews - admiring the way the inspector had mastered the use of silence as a weapon". So he was happy to learn from him. Singh found he was enjoying himself: "It might be about Chelsea but he thought it was also partly because he was not in Singapore. There, constrained by superiors who distrusted him, colleagues who were suspicious of his methods, subordinates who feared him and the endless red tape that engulfed any investigation, he did not have the freedom to follow his own instincts so single-mindedly. But here he was functioning partly as a private investigator and partly as some consultant flown in for his two cents worth of advice. It had led to a feeling of freedom from the normal constraints of police work." He never seems to practise his faith and there is no reference to it, although we are told that "for a man with as many enemies as Alan Lee to be finally bumped off by a stranger would require a divine providence with a sense of irony and that was not a possibility that Singh was prepared to give credence to." What he would be prepared to give credence to is never explained. But that is not where the author's interest lay. Her concern was in exploring Asian life and the relationship between people of different races and religions, and in this she succeeds very well. It all makes an intriguing read. The author has her own website, and there are interview with her on the Piatkus and the Crime Watch sites. There is also an interesting video interview with her from the Sydney Writers Centre. The cover is bold and effective.